(internal number / internal number: BJ294- 0.5-million). BJ294-0,5 # Bilger (Roco) H0/Dc 22 503 (?). Freight Car/High-Sided Wagon Dr Nem. -gesupert, below marked with stickers of Bilger. -Base of Roco. Roco / Preiser - WilliamsCircus Car Set - as New, Never Used All Accessories for wagons & vans still sealed in plastic bags All in Excellent Condition. Has been in storage for many years . Piko (GDR) 5/6446/016, 2-axle boxcar G of the DR (GDR) SEA FISH, white, like new in ovp. Manufacturer: Piko (GDR), no. 5/6446/016. Spurweite H0. Marke Piko. Internal allocation number 34053. Product Code 76856. ROCO 76856-H0 SNCF Gabs model 1:87-boxcar with sliding doors Ep. Boxcar SNCF Gabs model with sliding doors Ep. CAB code Gabs. ADMINISTRATION SNCF. Amministrazione ferroviaria SNCF. 95345-H0 PIKO 1:87-Boxcar FS pitched type F Ep III 1024139. Boxcar FS to pitched roof type F Ep III 1024139. Product Code 95345. Produttore Piko. ADMINISTRATION FS. Amministrazione ferroviaria FS. Certifies limited edition NO. Piko Classic 54926 HO 1:87 Säuretopfwagen Uhk6716 Acid Wagon of the Deutsche Reichsbahn (East Germany), epoch IV. Marke Fleischmann. Spurweite H0. Internal allocation number 34133. With KK scenes and NEM shafts with Roco universal couplings. F itted with NEM coupling pockets. Marke Fleischmann. Spurweite H0. Internal allocation number 34074. Manufacturer: Klein Modellbahn, No. 3047. Marke Klein Modellbahn. Small Model Train 3047, 2-axle open freight wagons with hanger of FS Italy, brown, KK scenery, as new in original box. Spurweite H0. Internal allocation number 34117. Roco 51303-2 & 51303-3 HO 1:87 Crane wagon and barrier wagon plus box wagon (tool van). Both are finished in the colours of the Spanish Renfe and are suitable for Epoch V - VI. Klein Modellbahn 3076, 2-axled high board car Omm 52 of the DB with brakeman's platform, brown, KK scenery, like new in ovp. Manufacturer: Klein Modellbahn, No. 3076. Marke Klein Modellbahn. Spurweite H0. Manufacturer: Klein Modellbahn, No. 3051. Small Model Train 3051, 2-axle high board car Omm ÖBB Austria, brown, KK scenery, as new in original box. Marke Klein Modellbahn. Spurweite H0. Liliput bachmann L225021 BP tank wagon HO gauge in excellent boxed condition. 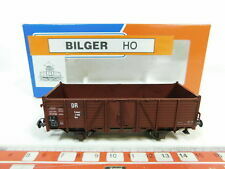 Two Boxed HO Liliput wagons 24415 & 21402 Made in Austria. Two Boxed HO Liliput wagons 24415 & 21402 Made in Austria.. Condition is Used But in very good condition.High sided bogie wagon with opening doors and sprung buffers.Boxed.24425. OBBGoods wagon with Brakemans hut . Boxed.21402. Deutsche Reichsbahn.Track not included. Any DCC fitted/sound models, if not fitted in the factory, have been professionally done. Model Condition: Mint - appear to have never been used at all. Add to Favourites. Any DCC fitted/sound models, if not fitted in the factory, have been professionally done. Model Condition: Near mint - have barely been run. Add to Favourites. The Collection: From a very nice single owner collection of HO, OO and N Gauge. Model Condition: Very near mint - looks to have been continuously cared for and lightly run, if at all, there is one loose corridor piece in the box. H0 PIKO wagon small car of DR 23-01-18 nice EP III. Baugröße (Spurweite) Spur H0 (16,5 mm). Marke Piko. TYPE- GRHs. LILIPUT 255 07. WAGON #1238. DR GOODS WAGON. Any DCC fitted/sound models, if not fitted in the factory, have been professionally done. Add to Favourites. Ellis Clark Trains Gaurantee. Manufacturer: Fleischmann, no. 5204. Marke Fleischmann. Spurweite H0. Operation number: Hall 7417 DB. Condition: Very good used condition. Internal allocation number 32260. Low side car with wheel loader GleisBau and cargo. This is a pre built model. 15.8x3.5x5.5cm Scale: HO. Product Scale HO. Product Code 76672. ROCO 76672-H0 1:87-boxcar OBB Gbs model with sliding doors Ep. Boxcar OBB Gbs model with sliding doors Ep. ADMINISTRATION OBB. Amministrazione ferroviaria OBB. CAB code GBS. Produttore Roco. MPN 537202. Codice del produttore 537202. Hbillss-y 2-axle freight car-DB. The Jouef Junior a range of HO model trains designed especially for kids & easily detailed by the experienced modeler. Baugröße (Spurweite) Spur H0 (16,5 mm). Zustand Neu. Material Kunststoff. Spurweite Normalspur. EAN 4250472274485. Marke State Tool. Product Code 67082. Produttore Roco. DCC decoder onboard NO. ADMINISTRATION dB. Amministrazione ferroviaria DB. Scatola original sì. NEM Coupling Crank motion of removal. Interior lights NO. 48883 Brawa Tank wagon type M3 FS, aluminum livery, black panels, sentry box. Tank type M3 FS, aluminum livery, black panels, with sentry box. Right of Withdrawal. Liliput 230144 H0, 2 PCs. Liliput spare parts. Marke Liliput. Baugröße (Spurweite) Spur H0 (16,5 mm). 05162 Roco mini tank H0 Kit Bell UH1-D helicopter SAR 1:87EUR 24,99. HO / e m start set it 2/3 wire. Set #0314 - D3/3 Swiss Loco with 3 Coaches Set #3664 - SBB-CFF - 3 Coaches Colour of Loco is Bluey Silver with Black Tender, Type D3/3 Very Rare Set Produced for the Swiss Market Only 1667AB 1st/2nd Class - 6543C 3rd Class - 7308C 3rd Class . Model railway lane H0 1:87; Roco 76831 NS = Nederlandse Spoorwegen Era III;. Marke Roco. Open freight car of the Dutch State Railways, epoch III. Railway Administration: Dutch railways era: III. Epoche Epoche III (1949 - 1970). MSRP £29.00 - Grab yourself a bargain! Klein Modellbahn 3281, 2-axle rolling roof wagon TS of the SNCB Belgium, brown, KK scenery, as new in original box. Manufacturer: Klein Modellbahn, No. 3281. Marke Klein Modellbahn. Spurweite H0. Condition: As new (from collection resolution). 6-axis tank car type ZZd. BRAWA ART. 48535. BOXCAR FOR MODEL RAILWAYS IN H0. VTG livery. Epoca Epoca III: dal 1945 al 1970. NOT SUITABLE FOR CHILDREN UNDER 15 YEARS. SALE BY INVOICE AND/OR RECEIPT. Kleinbahn 306, 2-axle roofed roofed boxcar E of the FS Italy, brown, as new in original box. Manufacturer: Kleinbahn, No. 306. Marke Kleinbahn. Spurweite H0. Produkttyp Container Tragwagen. Stromversorgung Gleichstrom. PIKO wagon Uacns Type silos 58434 "WASCOSA"-ep. Boxcar silos ipo Uacns "WASCOSA". Codice del produttore 58434. LADDER I HAVE -PIKO expert. numbering: < span class = "notranslate" > 37 80 9326 052-9. FLEISCHMANN H0 1:87-5328-boxcar refrigerator DB 23 80 806 6 033-1 Lup LOWENBRAU. Boxcar refrigerator DB 23 80 806 6 033-1 Lup LOWENBRAU. CAB code Lup. Produttore Fleischmann. Product Code 5328. ADMINISTRATION dB. Product Code 56249. ROCO 56249-H0 1:87-boxcar load gravel hopper OBB model Talbot. Boxcar load gravel hopper OBB model Talbot. ADMINISTRATION OBB. Amministrazione ferroviaria OBB. Produttore Roco. DCC decoder onboard NO. Marke Brawa. Produktart Waggon. Baugröße (Spurweite) Spur H0 (16,5 mm). Faller Car System N / HO. Brake blocks in wheel plane. Individually mounted axle box and spring assemblies. You will receive our bank details after our checkout. Electrotren E19021 HO 1:87 RENFE R.N. set of 2 open wagons wagons "TE", one with break cab, both loaded with coal, era IV, fitted with NEM coupling pockets.